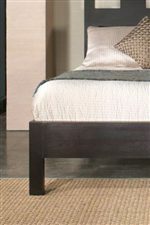 A perfect blend of traditional and contemporary design styles, this low profile bed is crafted from Mahogany solids and various veneers in a rich Espresso finish and offers an underbed storage unit. A sleek panel headboard with two rectangular cutouts, one on either side, and gently flared wooden legs create a stylish accent in any master bedroom, while two storage drawers with dovetail drawer joints and ball-bearing drawer glides offer high functionality. Drawers include built-in media storage bins to facilitate organization. Due to its low profile frame, this bed does not require a box spring. Select from Twin, Full, Queen, King and California King sizes. The Nevis King Low Profile Bed with Storage by Modus International at Michael's Furniture Warehouse in the San Fernando & Los Angeles area. Product availability may vary. Contact us for the most current availability on this product. PB23DB Drawer Boxes 1 48" 19" 16"
The Nevis collection is a great option if you are looking for Contemporary furniture in the San Fernando & Los Angeles area. Browse other items in the Nevis collection from Michael's Furniture Warehouse in the San Fernando & Los Angeles area.